Musings 'n scribblings of a philanthrope .. : Checklists - importance and benefits ..
Checklists are an important quality tool ..
Force and aviation industry to help save lives and aircrafts and in large building construction and so on. Even ISRO goes through a minute and detailed check list before they plan the building and launching of space vehicles, each time over and over again. Every launch has a detailed set of procedures to be executed in an order to ensure quality of the process. They cannot afford to go wrong in any of the steps and have to be more than 100% confident that their processes are the best and will not fail. We use checklists in almost all facets of human activity in our personal life, right from planning for a journey or picnic to planning for a marriage reception or higher education etc. We use it quite extensively in Industry to enable efficient co-ordination of activities and events in transportation, production, maintenance activities. This helps to avoid missing out any of the important points or steps, either through forgetfulness or over-familiarity. When we do not carry out the tasks as given in the Standard Operating Procedure or as per rules and procedures, we are bound to commit errors leading to major catastrophic events that can bring untold damage and costs. 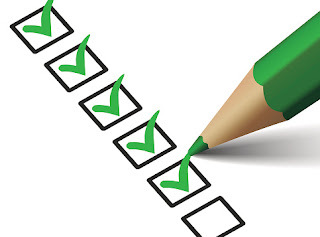 A checklist thus ensures that we proceed according to the Standard Operating Procedure (SOP), more so for a repetitive procedure. The basic premise of using a checklist is to improve the quality of the product or service being offered to the end user or customer. Even an expert in the area may miss to follow SOP or certain steps which could lead to poor quality or product or service delivery. It is human nature and tendency. In these days of specialization and super-specialization, it is difficult even for the super-specialists to remember each and every action. completeness in carrying out a task. A basic example is the "to do list". For example, before the pilot starts an aircraft, mandatorily he has to go through a procedure of checking the meters and gauges in front of him to ensure that all the equipments and meters in the cockpit are working perfectly fine and in good operable condition. A more advanced checklist would be a schedule, which lays out tasks to be done according to time of day or other factors. It can be used in project management to ensure that critical tasks are not missed and it helps to give a time dimension to activities completed. In the most simplest form it is a piece of paper with activities to be completed listed (not necessarily in order of priority) and ticked out as and when the activities are completed. A primary task in checklist is documentation of the task and auditing against the documentation. Some examples are listed here. Used in quality assurance of software engineering, to check process compliance, code standardization and error prevention, and others. In the area of academics, it's use cannot be overstressed as it gives the faculty member an idea of the overall picture during the teaching term. 2. click here for a check-list before going on a family picnic. In Alliance University, Bangalore, India, some of the faculty do use check-lists to improve the service delivery process and it has been yielding great results. Your comments would be highly appreciated in the comments column. PS : I was first introduced to checklists by my father while serving SBI. It got more pronouned seeing brother-in-law, who was the Sub-collector. Every day morning he prepares a list of activities to be carried out for the day. As the day progresses, he ticks activities that have been completed and frequently reaches for it in his shirt pocket for activities that need to be completed in the course of the day. I too started doing it regularly regularly. I have also seen my father using it regularly to plan his work schedule for the day while working in SBI.